This is just a short announcement what we did to make life better on DC for June Release. Better tables formatting, anti-spam, better email notifications and bug-fixes. We added items and a context menu which provide a way to add/remove rows and cols. See the gif. Anti spam moderation Now comments from new members first go for moderation every time - you will not see it and do not get the notification before it will be permitted. So spammers will not bother you with emails from DC anymore. Now Members' page has sections which will show only articles, questions or announcements. E.g. 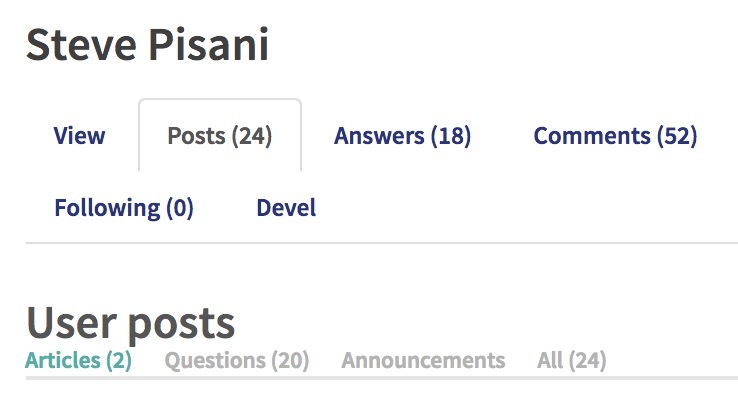 here is @Steve Pisani articles, questions and all posts pages. If you are using the "New" filter, which shows you posts, which either you've never seen, or which were updated since you had seen it last time, you may find useful new "Mark as read" and "Mark all as read" if you want to mark posts as "read" without opening it. "Mark as read" works if you just click on a "New" green label. "Mark all as read" button is available on top of "New" filter page. simplified titles for email notifications which lets it group into conversations around one topic. and a lot of smaller bugs were fixed too! Here is small gif how table row/col menu works. Stay turned, add your enhancement requests for DC and of course share your great experience with InterSystems Data Platform and newly released InterSystems IRIS 2018.1.1!